Cyanite was sold one timid eevee . Last edited by LuckyBOyTR on Sun Mar 24, 2019 2:41 pm, edited 1 time in total. Price: 4k - 7k (Depends on IVs) per pokemon, 8 - 14k total. 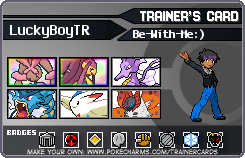 Pls Check LuckyBoyTR's Trades Page, I have put up for u.
I have stopped breeding Eevees with Timid Nature. I have not got Timid Eevee at the time. So Modest eevee will work with you? If yes Pls Check LuckyBoyTR's trade.